I need a better way of carrying my gear to the range instead of the jumbled cluster I have in a backpack. I use the TAG range bag, and I like it a lot. Get a pelican case and cut the foam to fit your gear. You will probably still want a back pack to carry your other stuff like ear pro, water and what not. What kind of guns will you be using? I like the idea of using a pelican case too. I just use one of my random old bags or sometimes an ammo box. I really should get a solid solution though. seems like a pelican case and custom foam are a bit over the top for a range trip. Cabela's carries soft range bags with cleaning kits built in, and the prices are not bad at all. I used to take a range box. eventually got too heavy and had to start carrying a second bag. Have now learned to toss pistols in their own gun rugs, and drop everything else in the duffle. Does not look nearly as cool as my aluminum case, but easier to lug around, and plenty of space. $30 tool bag from Home Depot. It's not tacticool but it gets the job done. Sturdy, plenty of organization, and it doesn't soak through if I set it down on wet ground. The pen is not mightier than the sword. If a man has a sword, he can make a man with a pen write anything he wants. The answer, then, is to have a pen and a sword. I use an old FDE condor soft rifle bag that I got for 40 bucks on cheaper than dirt about 5 years ago before I knew better. 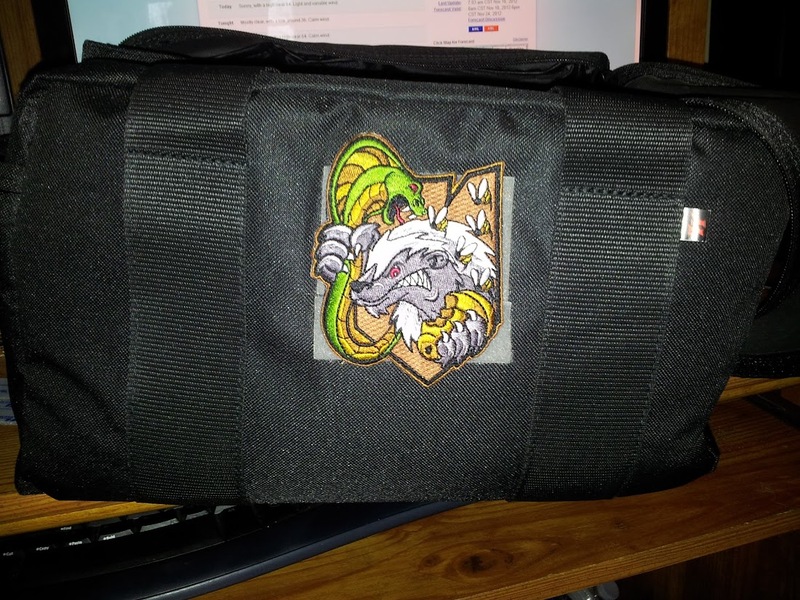 It has molle on the front of the outer pouch to carry things like mag pouches and GP storage pouches as well. If I knew then what I do now, I would have passed it up for something a bit more rugged, but it did its job without fail over the last half-decade. I am looking for something new to replace it, preferably with the ability to hold my shotgun and my rifle at the same time. Pelican offers a hard case/soft bag combo that lets you carry everything you need discreetly in a slick soft bag, which can be tossed in a hardshell case for travel. "Mr. President, Thank You for Having the Balls So Few Have" My greeting to G.W.B. when we met November 19, 2010. I hate to admit it, but I have a Winchester bag I bought at walmart for less than $20. It holds everything I need just fine (I keep my gun in the glock hard case). It has an outside pocket, and two inside pockets. I know there are better ones, but for what I have and the pricepoint, I don't think you can beat it. Here's a few really good options. Eagle makes a few good ones for a medium price (Range Bag, Pistol Pouch) if you can find them. LBT makes a "Medium Pistol Pouch" and Tactical Tailor makes a series of dedicated range bags. Also, First Spear makes the "Skirmisher Firearms Training Bag" and Filson makes the Filson Sportsman's Bag. For the price point however, HSGI makes the "TEA Bag", I can also see an Eagle Large Gadget or Medical Bag functioning as such, along with an OSOE Clothes Bag. TAG Makes one too/also. Look into Re-Sails Bags. I have been considering both the Randge Ready Bag from 5.11 and the compact range bag from maxpedition. I think I am leaning towards the 5.11 because I beleive it is larger and cheaper. What do you guys think? I have rolled a Range Ready Bag for a while now and absolutely love it. The bag is extremely well made and the way the shoulder strap is made, it feels much less heavy than it actually is. I actually purchased a second one and use it as a tool bag. They both still look brand new, but they are several years old. I use a bag similar to that 5.11 for my range bag.